Ekrem Akdeniz, Mustafa Suat Bolat, Necmettin Şahinkaya. In this study, we aimed to investigate the impact of percutaneous nephrolithotomy on kidney functions in stage III or higher chronic renal failure patients using glomerular filtration rate and serum creatinine level. Methods: Between 2010 and 2014, percutaneous nephrolithotomy was applied to patients who had glomerular filtration rate below 60 mL/min/1.73m². Preoperative demographic features, stone burden, and localization, urine analysis and microbial test, serum creatinine level, open urinary system graphy, and spiral non-enhanced computerized tomography were obtained. 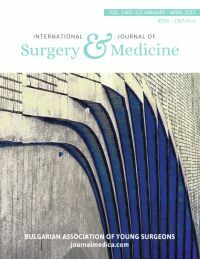 Intraoperative renal unit counts, anesthesia and surgery time, and X-ray exposure time were calculated. Early and late postoperative complications, hospitalization time, stone-free rate, and glomerular function rate were evaluated, retrospectively. Results: Preoperatively, mean creatinine value was 2.42 ± 0.76 mg/dL, mean glomerular filtration rate was 45.3 ± 3 mL/min/1.73 m², the mean stone burden was 393 ± 40 mm², mean intervention time was 79 ± 34 min, and 12 patients were stone free (70.5%). The decrease of hemoglobin 1.6 g/dL and transfusion was done only two patients (11.8%) due to excessive bleeding. In early and long-term follow-up, mean creatinine values and glomerular filtration rate were 1.98 ± 0.72 mg/dL, 2.16 ± 0.78 mL/dL and 54.1 ± 14 mL/min/1.73 m², 51.8 ± 15 mL/min/1.73 m², respectively. Comparison of preoperative and postoperative creatinine and glomerular filtration rates revealed a significant decrease in creatinine level and increase in glomerular filtration rate. Conclusion: Percutaneous nephrolithotomy that eliminates urinary obstruction is safely used in the treatment of kidney stones with minimal damage on kidney functions. Stage III or higher renal failure patients who have obstructive kidney stones or recurrent urinary tract infections can effectively be treated, and this may help patients to prevent progression to end-stage renal failure. 1. Romero V, Akpinar H, Assimos DG. Kidneystones: a global picture of prevalence, incidence, and associated risk factors. Rev Urol 2010;12:86-96. 3. Alexander RT, Hemmelgarn BR, Wiebe N, Bello A, Morgan C, Samuel S, Klarenbach SW, et al. Kidney stones and kidney function loss: a cohort study. BMJ. 2012;345:e5287. 5. TÃ¼rk C, Knoll T, Petrik A, Sarica K, Skolarikos A, Straub M, Seitz C. EAU Guidelines on Urolithiasis. European Association of Urology 2015. 8. Gupta M, Bolton DM, Gupta PN, Stoller ML. Improved renal function following aggressive treatment of urolithiasis and concurrent mild to moderate renal insufficiency. J Urol. 1994;152:1086-90. 12. Knoll T, Wezel F, Michel MS, et al. Do patients benefit from miniaturized tubeless percutaneous nephrolithotomy? A comparative prospective study. J Endourol 2010 Jul;24(7):1075-9. 13. Sabnis RB, Ganesamoni A, Doshi AP, et al. Micro percutaneous nephrolithotomy (microperc) vs retrograde intrarena lsurgery for the management of small renal calculi: A randomized controlled trial. BJU Int 2013 Aug;112(3):355-61. 17. Etemadian M, Maghsoudi R, Shadpour P, Ghasemi H, Shati M. Outcomes of tubeless percutaneous nephrolithotomy in patients with chronic renal insufficiency. Iran J Kidney Dis. 2012;6(3):216-8.